If you live locally and would like to make an appointment for Boarding or Grooming just call or email us and let us know when you'd like to bring your dog by. Boarding: Indoor/outdoor, heated. Fenced in exercise yard and training room. Our pick up and drop off times are 8-9am and 8-9pm. Grooming: Beth is a graduate of the New York School of (All Breed) Dog Grooming. If you would like to make an appointment via email, give us 3 choices of days/times when you'd like your dog "beautified" and tell us the breed and what you would like done. Also, please include your phone number. OR Phone us at your convenience. 8 week Positive Training obedience group session for puppies and adult dogs. Covers all basic obedience commands. Advanced classes and private instruction available also. Also do private training, and agility training (call for dates and times). Training: Beth trains in the most humane, POSITIVE REINFORCEMENT methods. She will train for basic manners, hunting, agility, correction of bad habits, tricks and most other training. Call for prices. or call us by phone at 585-547-3767. This is the Apple of Beth's eye. The Mascot (puppy photo/poster girl for LL). Now 10 yrs. 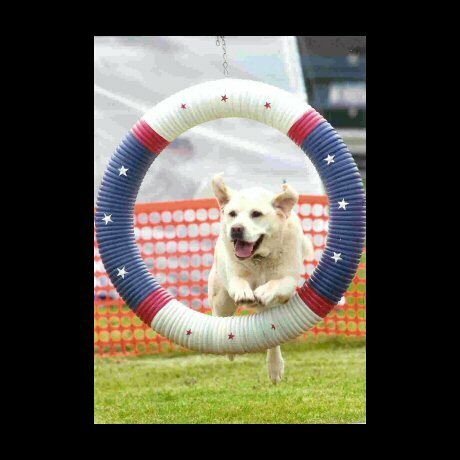 old Here Cuppy is completing her final round for the "Excellence" title in agility. She started later than most but qualified 6 out of 7 times for her titles.